Today we are exposed to hundreds of wonderful bathroom images, but do they suit the layout of your bathroom? Italia Ceramics offers five simple tips to make your small bathroom bigger and more functional. Designing a bathroom is a delicate balancing act, creating a calming atmosphere that is desirable, and functionality is paramount. When designing your bathroom it is best to avoid moving your plumbing, so plan to keep the bath, shower, basin and toilet in the same location where possible. This will help keep your cost down and provide a starting point on what you liked or may not like on your previous bathroom setting. What colour tiles are recommend? Dark floor tiles with lighter tiles on the walls, has always been a favourable option in bathrooms. Why you may ask? Dark floor tiles are not only more practical they also make small bathrooms look bigger. 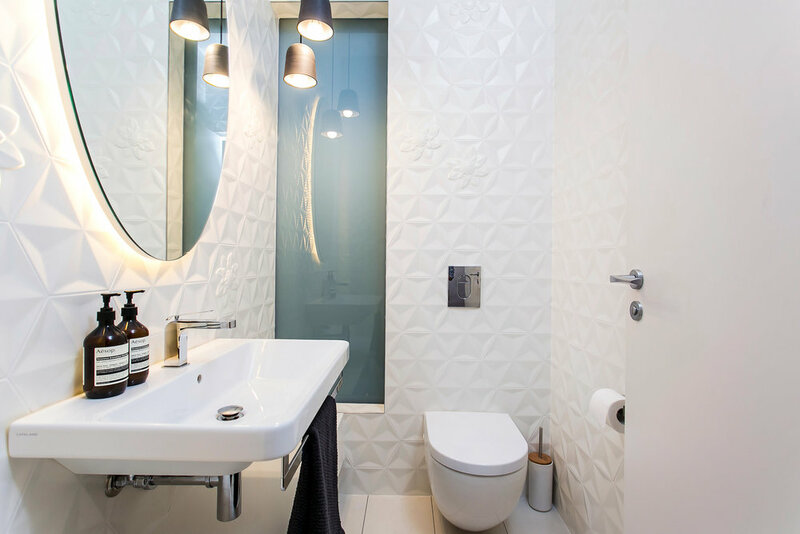 A dark floor tile combined with light tiles on the wall works with any bathroom design, whether modern or traditional. Make sure to blend your dark floor tile with your wall tile to make the space in the bathroom feel more generous in size. Adding a touch of colour will portray your personality and flair. How to design a bathroom with limited space? It might seem contradicting, but choosing larger tiles for a small bathroom works because you have less grouted joins which gives the illusion of more space. An oversized diamond pattern on a bathroom floor can create diagonal lines that give the eye a longer path to follow from one side of the room to the other, so the room feels bigger than it really is. Use large mirrors to help double the apparent space. Like any other room, decorating the bathroom towards a theme of choice will make your design selection a much easier decision. You should consider the mood and atmosphere to work within your theme that is not only unique but a serene sanctuary. Natural light in the bathroom plays an important part to interior design. Consider the amount of natural light you will receive during the daytime and the intensity of lighting you choose. It is important to prevent a bathroom looking too dark but also a non-overpowering fluro light. Lighting can make a big difference in small bathroom settings so it is important to consider all options.